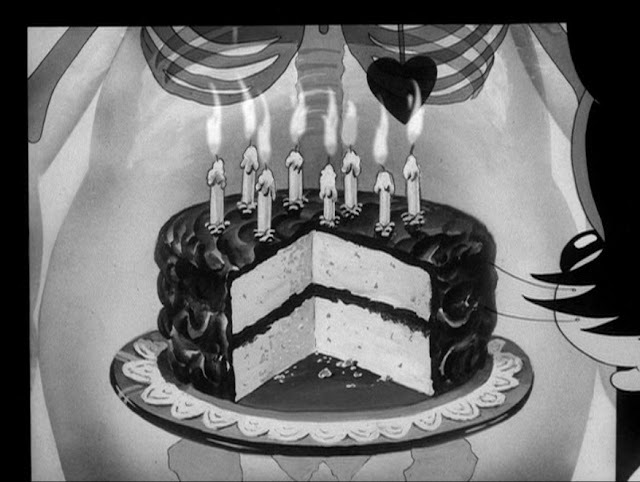 The Rail of Tomorrow: Happy 100th Birthday, Bob Clampett! 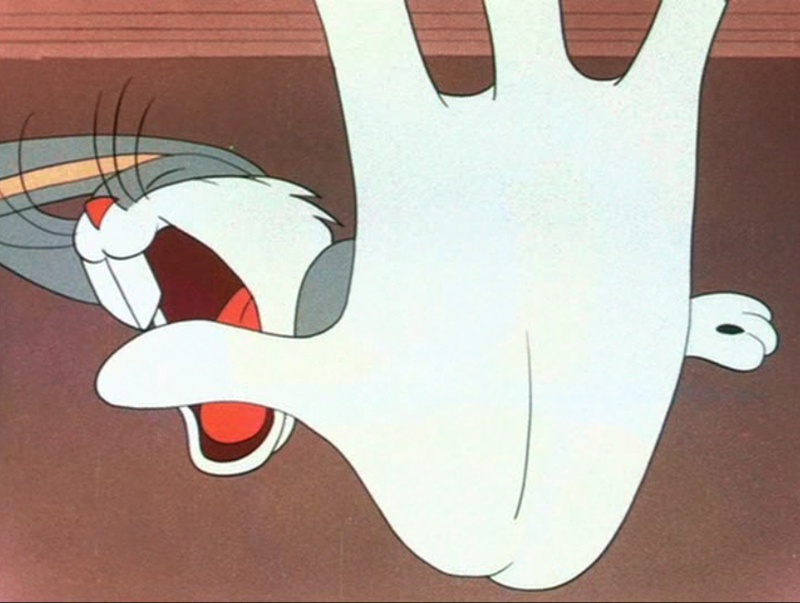 There's no real overstating the effect Bob Clampett's work has had on me. 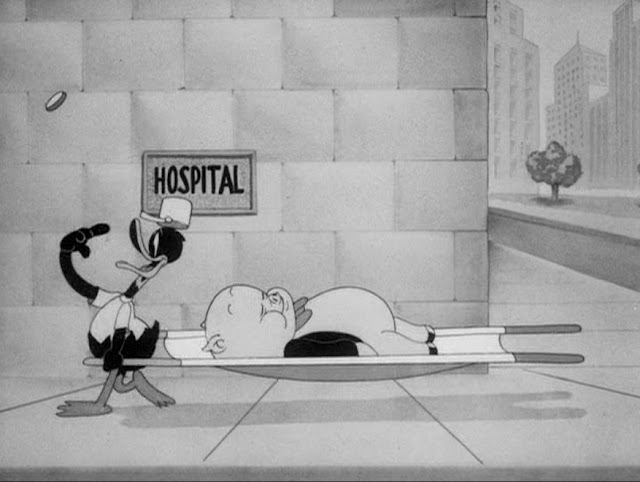 Far and away my favorite director of animation, Clampett's cartoons were truly looney, unafraid to push gags to their most extreme, or characters to their most unlikeable. 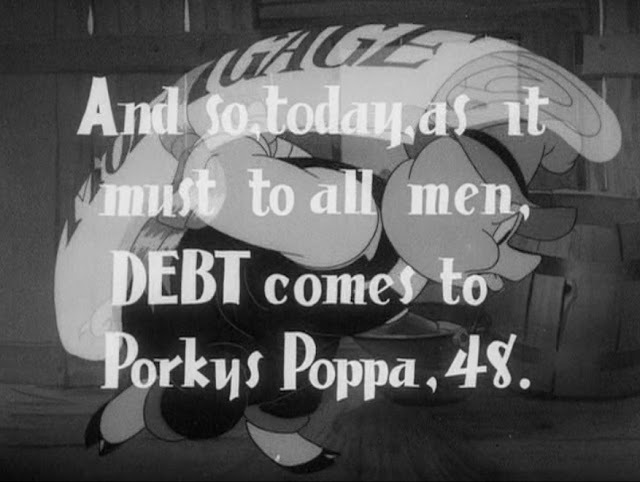 His were the first cartoons in which I really sat up and paid attention to whose name the title card bore, and in this way, was as instrumental to me understanding the role of the director as seeing O Brother, Where Art Thou? or The Royal Tenenbaums for the first time when they were released. Like the Coens or Wes Anderson, Clampett's style was so distinct that, try as I might, it was difficult to find others like it. Before these guys, I assumed - as, I think, most people do - that there are a set number of styles and genres in which a filmmaker could work. Especially looking at a set of Looney Tunes, one sort of understands the rules of the game, as it were. Some of the character movements in Clampett's films are so fast and brief that they come across as a flurry of images too fleeting to register. Frozen, they reveal some of the extraordinary means that the director and his animators used to achieve those effects of speed. 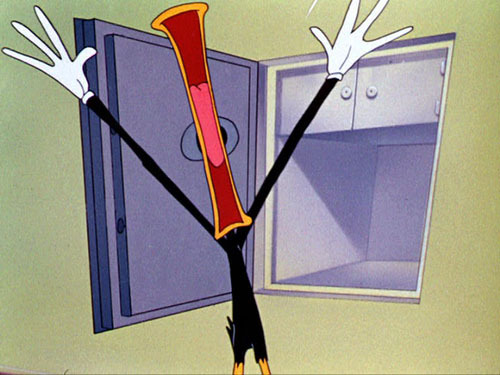 Clampett was also adept at highly exaggerated reactions and hilarious distortions of the animal body. Watching these cartoons with a finger on the pause button can yield hilarity and teach you a lot about the normally hidden aspects of the art of animation. I won't say too much about Coal Black and de Sebben Dwarfs, as it's...undeniably uncomfortable in so many respects, but it is such an incredible, absolutely stunning piece of animation, completely out of control and desperate to keep up with its own rhythm. Even amongst Clampett's work, there's nothing like it, and while I might still prefer Draftee Daffy or The Great Piggy Bank Robbery, it's very, very easy to see why many consider it his masterpiece. 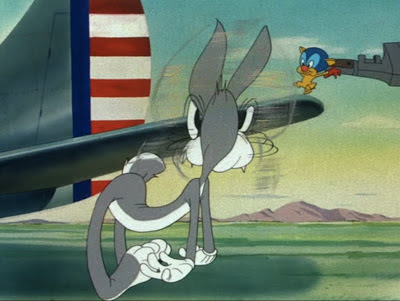 And as much as most Looney Tunes prey some way on violence, jealousy, and general bad manners, there was something especially depraved about his work that I sensed on some level even as a kid. I mean, you watch something like The Wacky Wabbit, which ends with Elmer Fudd attempting to physically extract a gold tooth from Bugs Bunny's mouth, that leaves a mark. Draftee Daffy, perhaps his most subversive work, has Daffy cheering on the U.S.A. from the comfort of his own home, but when Uncle Sam comes calling in the form of the Little Man From the Draft Board, he does everything in his power to escape, eventually flying away on a rocket that crashes into the ground and sends him straight to Hell. 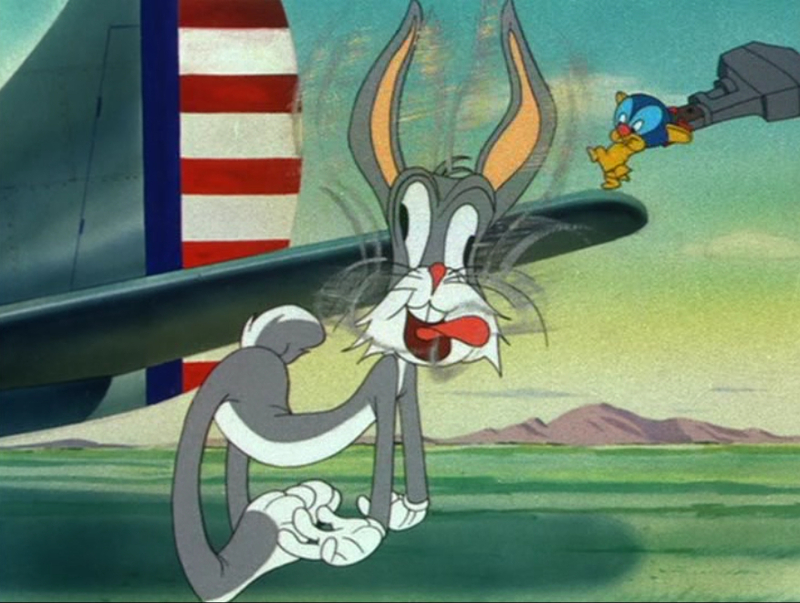 Old Grey Hare, which imagines Bugs and Elmer Fudd in the future, ends with Bugs digging him own grave, only to shove Elmer into it and bury him alive. Somehow, the way he extended these gags let them sit a little longer than the onslaught of violence to which we're accustomed in most Looney Tunes. We'd have time to actually wrestle with these, so while the dynamite or getting-whacked-on-the-head gags could still be brushed off, he'd still work in these sort of uncomfortable, extended acts of cruelty that made his versions of these even-then-iconic characters much less than simple mascots. They were our Id, unleashed in spectacularly wild form onscreen. 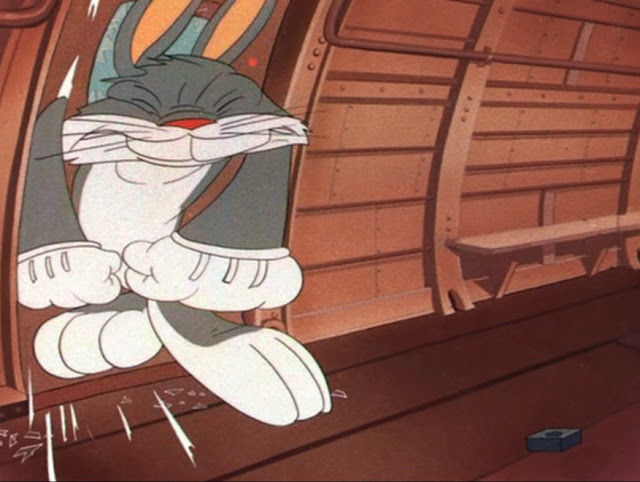 His colors (when he had colors) were a little more washed out, a little grimier, than the bold-color house style of Chuck Jones or Friz Freleng or Robert McKimson, lending his later work an earthy, can't-quite-wash-off-the-dirt feeling. I remember as a kid finding what I now know to be his Bugs uniquely uncomfortable. 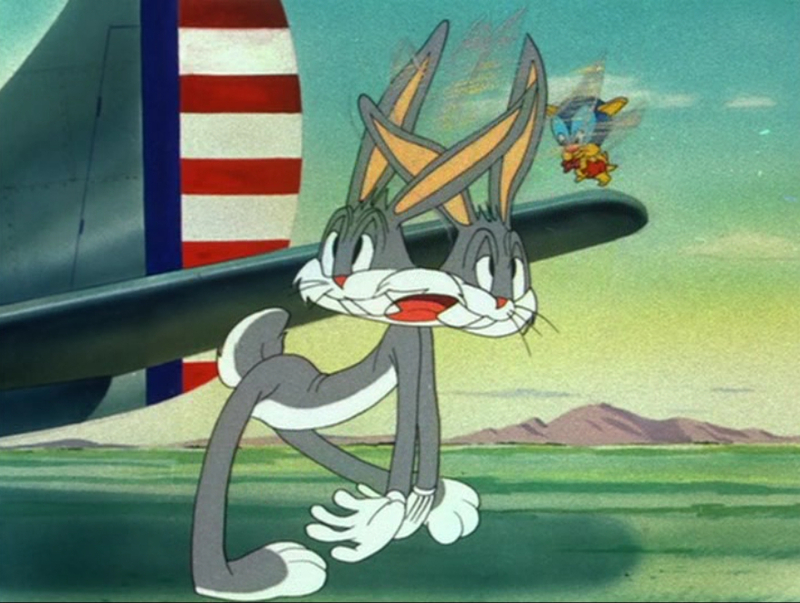 Whereas Jones' version was sly and sort of reassuring, Clampett's Bugs was dastardly in a decidedly unsafe way. 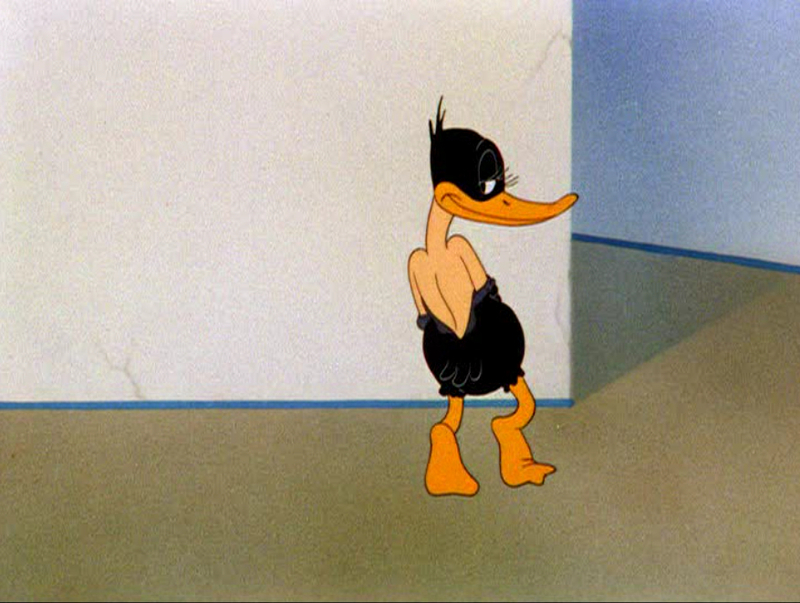 As for his Daffy, well, to me there is no other version. He still possessed much of the selfishness and bitterness that would come to define him during Jones' reign and, sadly, forever since, but, in addition to lending him the spirit of a real prankster, the expression of this was much looser, more unwieldy, more unpredictable. Draftee Daffy is one of the funniest films I've ever seen, so much so that it's almost impossible to highlight individual moments, but the one that always, always, always get me are when Daffy, certain he is finally rid of the Little Man From the Draft Board (having stuffed him in a safe and put a brick wall around it), yells "so long, Dracula! 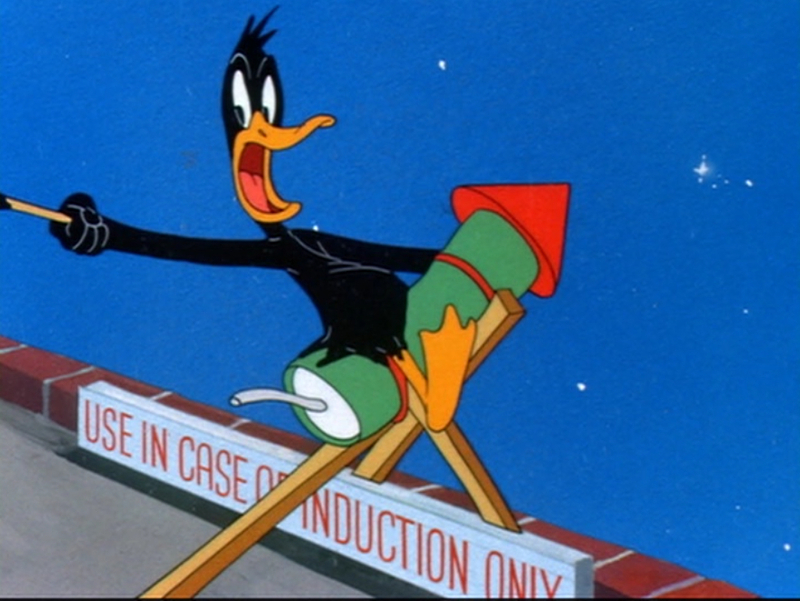 ", jumps on a rocket (atop a sign that says "Use In Case of Induction Only"), and flies away. Some who knew Clampett personally said he really was Daffy Duck in real life, prone to wackiness himself and given to dispatch with problems in bizarre manners - he'd have a meeting with a boss, and if he sensed trouble coming, he might excuse himself to make a phone call and never come back. Perhaps he wished for a similar escape to the one he granted Daffy, but knew, like in his creation, that trouble would rear its ugly head again. But more than anything, he just makes me laugh, so hard, no matter how many times I've seen a given cartoon. They're so fast-paced, so packed to the brim with seemingly-spontaneous bits of humor, you'd think they were crafted precisely at the pace they play out. How someone could plan these bits out over such a long time (the cartoons usually took about a month to make), yet still make them feel spur-of-the-moment never fails to astound me. There are throwaway gags in his work funnier than most feature films. 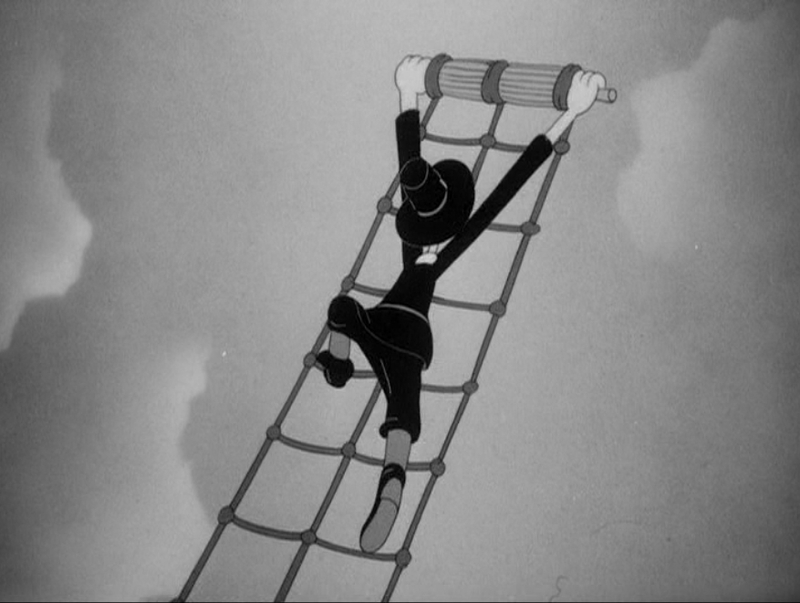 Elmer Fudd drawing and X, winding up, and then proceeding to dig in an entirely different spot; Daffy answering an especially tall telephone marked for long distance calls; Humphrey Bogart tossing Lauren Bacall an enormous cigarette lighter in a scene played totally seriously; Daffy carrying an entire stretcher by only holding one end, then flipping a coin with one hand; ink spilling from and then refilling a bottle as a ship rocks back and forth...there's no end to it. Today would've been Bob Clampett's 100th birthday, had he not died in 1984. He lived not without controversy, and was alternately revered and despised by those who worked with him at what would come to be dubbed Termite Terrace. I certainly don't know the truth of the accusations lobbied against him - maybe nobody still living does - but as far as I'm concerned, the work speaks for itself. Whatever favoritism was granted him seems wholly earned. If he stole others' ideas, he either stole all of them or twisted them to such an extent that they were unrecognizable. He left everything else in the dust, and in the process, showed what this form was really capable of - not having a laugh at reality, but having a laugh at complete unreality. So celebrate his birthday with me by watching a few. Many are available online, or through the excellent Looney Tunes Golden Collections (you can buy the whole lot (six in total) for a mere $100), which remain among my prized DVDs. For now, I leave you with more images from Clampett's work. 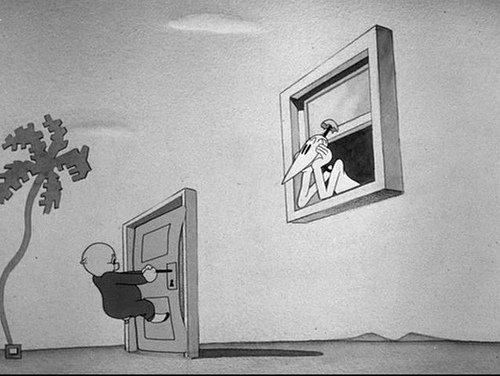 It should be noted that, according to Bill Melendez (the great animator who went on to bring Peanuts to film, and who worked in Clampett's division), Clampett rarely did the drawing himself, but gave the animators free reign to play on the gags and stories he outlined. He inspired then, and he inspires now. Just discovered this while looking for an image to illustrate an upcoming post (in this case, Porky in Wackyland which is my #1 short film of its years - and my favorite Looney Tune ever). I'm new to the Clampett party; really new, in fact - while I've known the name for years I'd never really parsed out which ones were his and didn't even know he'd directed my favorite. But then recently I began watching everything on my Spotlight Looney Tunes DVD that I've had for years (without really delving in) and realized that, consistently, it was his that were always my favorite. I'm a little surprised to hear you say that about the colors being washed out, because one of the things I noticed immediately on my particular disc (it's the one with Wackyland, and a number of show-business/music spoofs) is how vibrant and stunning the colors on the Clampett cartoons are - much more so than in any of the others. But maybe that's just the one that happen to be in this specific collection. 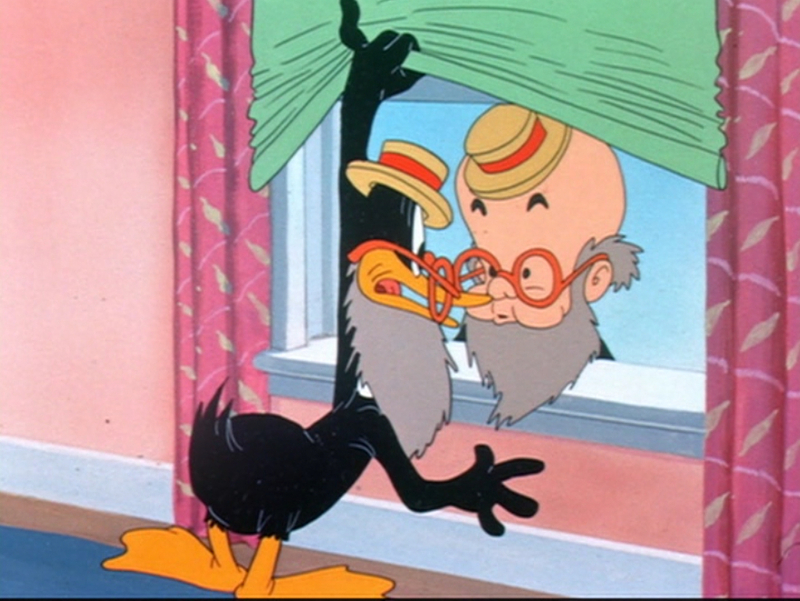 Anyway, I've always been a bit underwhelmed by Chuck Jones - he's clever and created many iconic bits but his more spare, simplified style isn't really my taste and I find a lot of the stuff he did falls into routine (same, but even more so, with Fitz Freleng). 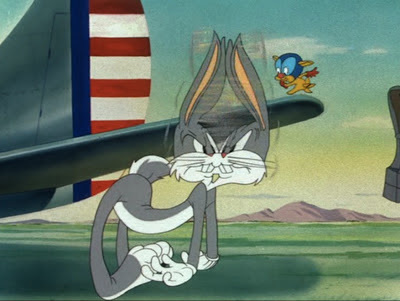 That's precisely why I like Clampett, that ability to cut loose and be completely unpredictable and liberated: that to me is what Looney Tunes should be, not a series of predictable gags with stereotyped characters but a wild joyride with protagonists who might very well be certifiable maniacs (I like the Bugs & Daffy of the early 40s much more than later versions too). interesting is the animal kissing. You must be very difficult to imagine that the animals can kiss like mankind. kissing games that you like to play, you will enjoy yourself in these kissing games!anna games Enjoy!